it does events not posts. The event calendar widget will display for each day, a hyperlink title (displays on hover). This title is a comma separated concatenation of the titles of the events for that day. It is not configurable. The list widget display is highly configurable. If your event descriptions are short, you may want them to display in the widget, but if they are long, maybe the title is enough. Display below with expanding and contracting css ? or just display normally ? In the upcoming event list widget settings, one can switch off the ‘hover’ of the description in the link of the summary. Please ensure that you are on the latest version (3.1 or amr-events or 1.0 of amr-ical-events-list) as this feature was briefly lost when the small calendar was introduced. the default css will hide the description field (if selected for display in the listtype) and only show the description on hover over the event. to show the description permanently, you need to either switch off the default css – your theme’s css will apply, or customise it. See ical events list general settings. The default list type for the list widget is number 4. (you can of course create an entirely custom one). By default the description is NOT shown (ie it has a 0 in the column field). 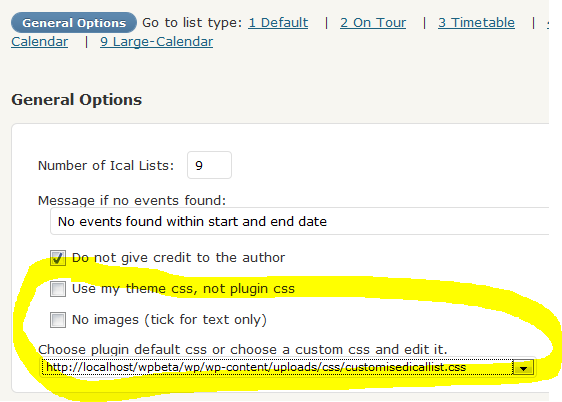 If you want the description or any other field to show IF it exists in your ics file or wordpress event, then you need to assign it to a column. For the widget ‘1’ is a good option.